The questions are beginning to come in... We recently made the rounds among our old friends in Texas, visiting with as many as we could during our short trip "home". Everywhere we went people were curious! I guess they thought we would fall off the edge of the earth! My Doctor told me "I saw your name on my schedule and thought... You're ALIVE!". Yes... we're still alive! And now we're officially... Newly Salted! Newly Salted is a collection of interviews with new cruisers. It has a companion site, Interview With A Cruiser, where you can find interviews with those more "seasoned". Both projects were on my list of regular internet resources when I was in the "dreaming stage". Back in the early days, I never really imagined that one day I would be posting my own interview. So, without further ado... let's get started! Who are we? Bruce has been sailing, mostly on a lake in Kansas, for much of his life. 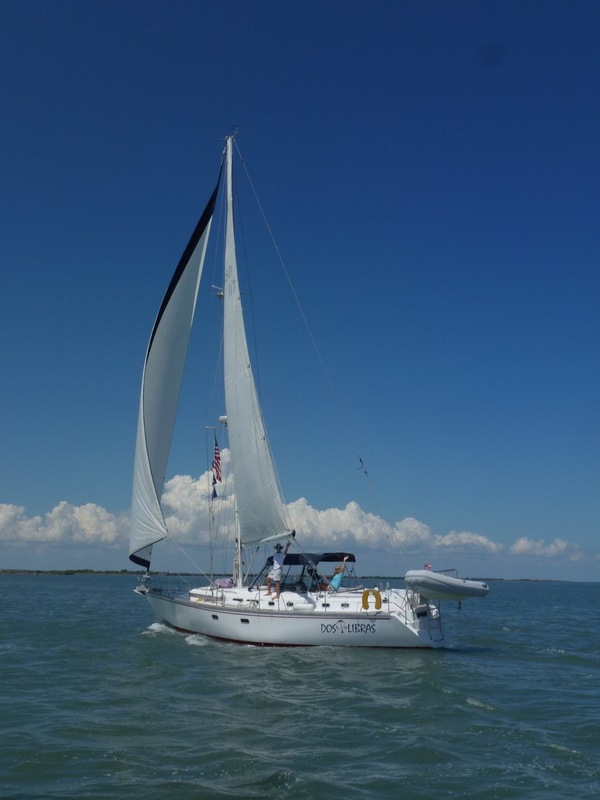 I (Tammy) started sailing in 1997 on Corpus Christi Bay. We met while participating as regular crew in the local Wednesday night sailboat races. We dated, married, and started working towards our dream of being among the lucky few that can call themselves Cruisers. 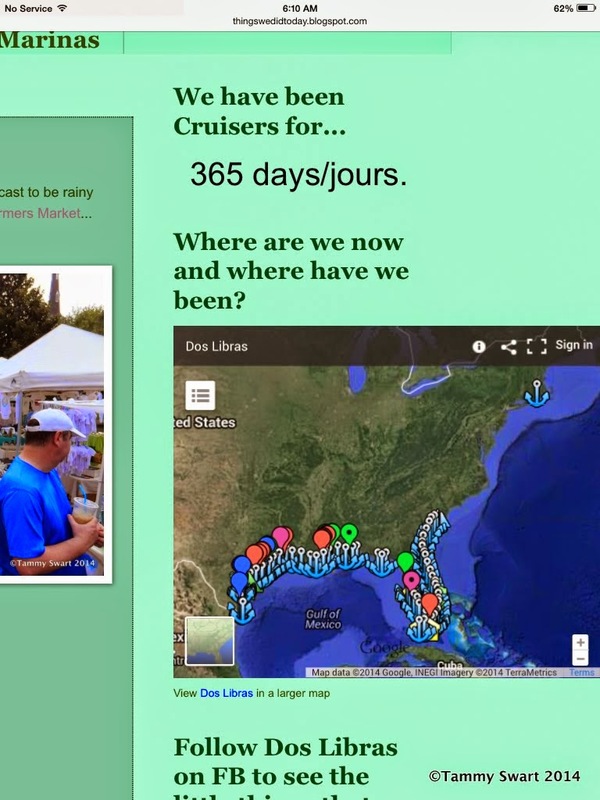 We tossed the dock lines on September 30, 2013 and have slowly worked our way from Texas, east along the Gulf Coast, down into the Florida Keys and back up the East Coast. We are currently cruising near Charleston, SC and will soon begin our second year of cruising... Bahamas Bound! One of the "Good" Anchorages - Boca Raton, FL. What do you wish someone would have told you before you started cruising? The first thing that comes to mind is a very practical thing. You might think that this one would be answered with something profound like "you'll still be yourself no matter where you go"... but no. We wish that we had been warned that the waters of the East Coast ICW were fertile (in the extreme), and that we would experience bottom growth on our hull in excess of our wildest imagination. Ever since our prolonged stay in Marathon, FL., we have been battling with an amazingly prolific "secret garden" beneath our floating home. The fast-growing "beard" can become unmanageable within days and it is home to thousands of small creatures. The murky waters of the ICW make it difficult to see well enough to get a good clean bottom, and the swift moving current doesn't help either... It is never-ending. Our record wind speed occurred while we were anchored near Titusville. We saw 46 knots. We were anchored in relatively shallow water and very near a small island when it hit. My concern was that we would drag anchor and end up beached on that island. We remained in the cockpit with the engine running so that we would be ready to take evasive action if it looked like we were getting too close. It was a very tense hour but we came through it unscathed. Hands down it would be the iPad! It has been the most important tool in route planning and I can NOT imagine doing this without it. 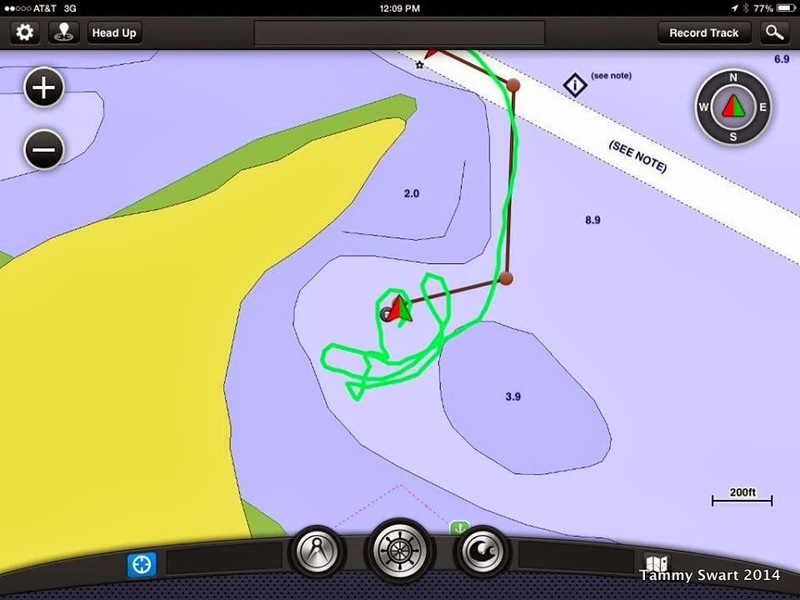 The applications that show tides, currents, anchorages, marinas and weather... all with our position superimposed on the chart... have made this a flawless operation. Second place would go to the AIS, although it was primarily valuable to us while we were traveling in the Gulf Coast ICW. The tug traffic there was so heavy, the ability to hail the captains by name as well as the ability to see and be seen from far around a blind curve, gave us an edge that boosted our comfort level. What was your biggest fear before going cruising? What is your biggest fear now? My biggest fear starting out was that we wouldn't be smart enough to do this. I worried that we would make stupid mistakes or just not be able to figure things out. My biggest fear now after a year... running out of things. I know, it makes me sound like a borderline hoarder! But I worry about running out of water. We still top off the tanks at EVERY opportunity and carry 25 gallons of "spare" water in jugs. I worry about running out of food, even though we provisioned for the end-of-time... The difference now is that I know what things we DID run out of and will stock up on more of those and less of other things. In my defense, it is NICE not having to stop and find provisions when we would rather move on. We can pick and choose our provisioning spots. Share a piece of Cruising Etiquette. Never... NEVER touch your feet when visiting with others. Going everywhere barefoot can lead to a certain relaxed attitude towards feet and while it is OK to arrive to your neighbor's boat for happy hour barefooted... it is NEVER OK to pick your toenails, corns or dig toe jam within sight of another soul not bound to you by a deep and abiding love. What do you think is a common cruising myth? You've probably heard this to the point that it should no longer qualify as a common cruising myth... It isn't all palm trees, white sand beaches and fruity drinks. While those things are a part of cruising, they comprise such a small part it is almost laughable that they continue to pop up high on the list. There are plenty of palm trees where we've been, but the white sand beaches have been surprisingly few. Cruising the US Gulf and East Coasts, we have encountered numerous beaches for sure... but not as many as we thought and VERY FEW had the dreamy white sand. Even the Keys were very short in the "Dream Beach" category. And as for fruity drinks... well, after our initial daily celebratory cocktails back in the beginning, we quickly learned that it is not healthy to drink EVERY day. We have settled into a happy medium of cocktails when the conditions warrant them, but sometimes... many times... water has been our first choice. Tell me your favorite thing about your boat. Our centerline queen sized bed. I love snuggling down into our familiar and cozy haven after a day on the water. No matter where we go, our bed is waiting for us. Clean sheet day is the BEST! What is the key to making the cruising life enjoyable? The number one thing is to let go of your compulsions. There is almost nothing that you MUST do today. It is OK to sit in the cockpit and read. All. Day. Long. The second thing - get off of the boat. There is a world of adventure waiting for you if you go ashore and explore. The boat will take you there, but you have to go and play. We ARE smart enough to do this. And if we can do it... you can too. We make it out here without the luxuries of society... and even enjoy it. It is OK, and even liberating, to live a life outside of your comfort zone. The waters before us are not unknown and treacherous, they are somebody else's "back yard". No matter where you go... there you are. It is true. Today looks like it might be our best chance for getting off of the boat for a WEEK! The weather is forecast to be rainy but today... a peek of Sunshine! A quick internet search filled today's agenda! First, the Charleston Farmers Market... then Drayton Hall! Sweet Potatoes as big as your head! We need not have worried though... there were plenty of beautiful fruits and veggies to be had. I've never seen such a selection! And the prices were surprisingly good for the common items. They did have some exotic stuff that was pricey, but our list was simple. The Market was comprised of veggie/fruit vendors as well as people selling home made items such as art, soaps and cheeses. There were multiple prepared food vendors in a sort of food-court section and the scents that wafted through the cool fall air were delectable. We cruised through there and took note of booths we might like to visit next week. Just past the food court, we found a troop of street performers doing some amazing things. They were breakdancing (is that still what it's called?) and their athleticism and strength was astounding. They were also wildly entertaining as well. We stood and watched until the show ended and tossed our contribution into the can. We cruised back through the market and finalized our choices. We loaded our loot back to the car like pack animals. Next stop... Drayton Hall! There is no shortage of historical homes and plantations in and around the Charleston area. How do you choose which one(s) to visit? Well sometimes it's better to be lucky than smart, and today was one of those days. During my morning internet search, I stumbled upon some information... Today was Smithsonian Magazine's Museum Day Live! I went online and printed out our ticket to tour Drayton Hall for FREE! There is not much that Cruisers enjoy more than anything FREE!!!! We enjoyed the half hour drive out into the country along the tree-lined Ashley River Road. There was a flock of wild geese guarding the final approach to the house. We presented our free pass and learned that we had arrive ten minutes before the next tour... SCORE! We parked and strolled out towards the lawn where we joined our fellow tourists beneath a huge tree. You could practically feel the history stretching back into distant times past. The voices of our fellow tourists could easily have been the sound of the Drayton family and their enslaved workers reverberating across the lush lawn in the quiet morning. Recent rains had left the air heavy with moisture and the ground was saturated, providing the perfect conditions for thousands of the tiniest little mushrooms I have ever seen! Our group was split into two as I guess there were lots of lucky people who had stumbled upon this FREE museum day! We followed Patty across the lawn and entered the home while her stories took us back in time. Drayton Hall was founded in the early 1700s by John Drayton, second son of Thomas Drayton. 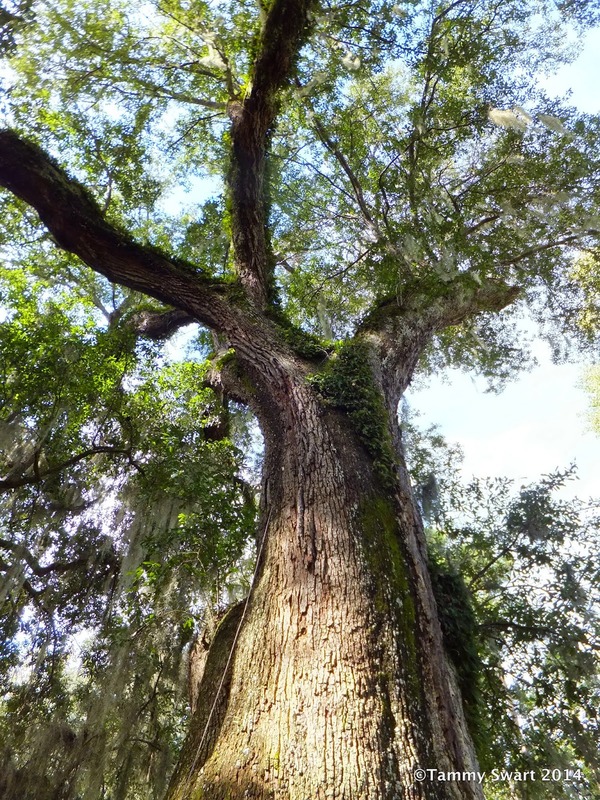 As second son, John did not inherit his birth home, nearby Magnolia Plantation. He had to make his own way... and Drayton Hall was it. Drayton Hall was home to seven generations of Draytons between 1738 and 1974. The last two descendants found it impossible to keep and sold the property to the National Trust. The property has been preserved, as was the wish of the family, and not restored. This means that it is kept in pretty much the same condition as it was during the over 200 years of it's families' history. It was designed to mimic the typical English Country Estate. The two flanking walls and outbuildings are no longer here. Only the pads of the outbuildings remain. The paint on the walls is the original... there were only three coats of paint applied to these wall in over two hundred years! Drayton Hall has survived the American Revolution, the Civil War, hurricanes and earthquakes... relatively unscathed! The quiet rooms speak volumes if you listen. It's fascinating! We, sadly, were not allowed upstairs. I believe that on a normal day, the tour does include a glimpse of those rooms, but in the interest of preservation, the relatively large crowds visiting today were not able to see them. Hey, what do you expect for FREE??? But the Palladian influence of the architecture calls for symmetry and we were assured that the upper rooms were identical to the lower ones, with the exception of a later upgrade done by one of the family members through the years. We were next lead down into the basement level of the home. This would be where most of the household duties such as cooking and laundry were performed by the enslaved staff. The Bowens family were prominently noted for having also lived through the generations, alongside and servants to the Drayton family. We left the house and the tour to ramble on our own across the expanse of lush green lawn. The gardens that once graced the distance from the house to the Ashely River's shore are no longer kept. But again, the ghosts of what once was... were active in my mind. The quiet and serene river front must have been a favorite spot for the families who lived here. The house is surrounded by lawns. We strolled around to the River Road facing side and found the excavated pond. The water well. No modern convenience were ever added to the house. The motto: Leave 'em Rest is prevalent throughout the property as the wishes of the family to leave the house and grounds in their original condition have been followed through the years. 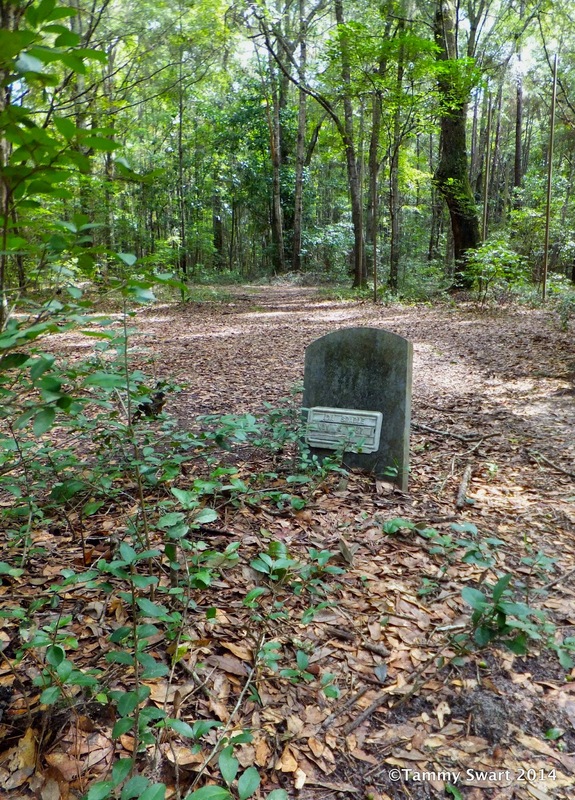 We followed along the moist and overgrown pathway where it is said, over 40 graves have been discovered... How many others lie out there never to be found? 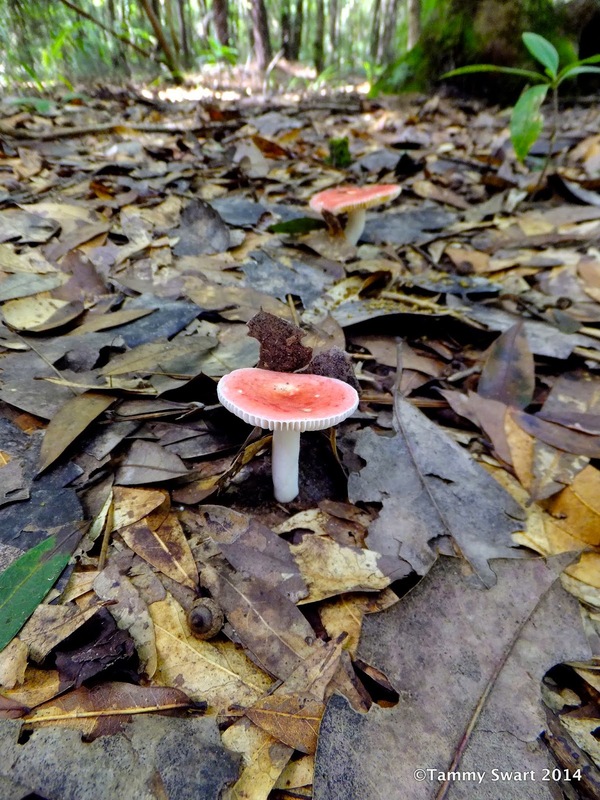 The place was awe inspiring as we stepped gingerly around the mushrooms growing here in this quiet and damp place. Our trip back in time had come to an end for today... but we look forward to many more historical interludes while we are here in Historic Charleston.